It’s not every day a dog becomes an unexpected hero, but this Australian Shepherd became one when she saved a small dog from being run over. 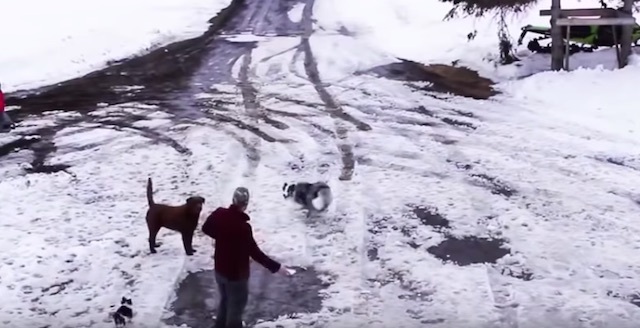 In a video shared by a dog owner in Canada, the big dog grabs the small dog in her mouth just as a car is backing up in a snow-covered driveway. 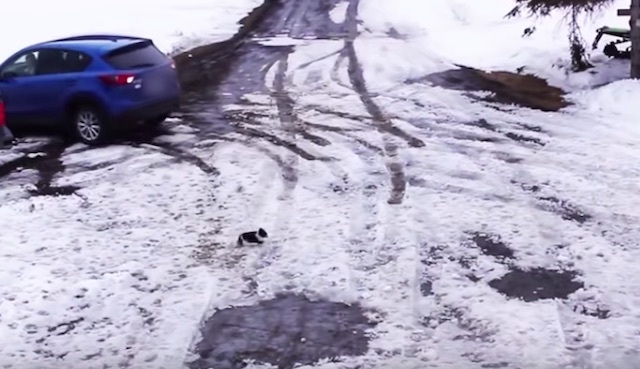 The surveillance video opens with three dogs – the Australian Shepherd, what looks like a Labrador and a small black and white dog – being taken outside for afternoon exercise and possibly a potty break by a man. The three dogs disappear from view of the camera and a few seconds later, a woman walks into the frame and goes to her car on the left of the frame. Then, the small black and white dog walks from the same direction into the camera’s view. That’s when the blue car begins to back up in the driveway straight towards the small dog. Suddenly, the Australian Shepherd appears from the right of the frame – sprinting directly towards the small dog. She knows her friend is in danger! She sweeps up the small dog in her mouth just in the nick of time. The blue car begins to drive away, oblivious of the close-call. A note appears in the video indicating the driver saw something in her review mirror and initially thought she had hit her dog. 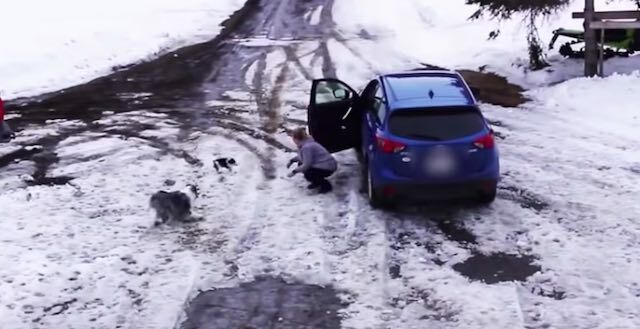 Immediately backing up, she exits her car to check on her dogs and the two dogs run over to her. She gives the small dog a hug in relief and pats her heroic shepherd dog before bringing the two dogs inside! What a scary incident and a strong reminder to make sure your fur friends are safely indoors or under control if you are planning to drive anywhere near your home. This particular incident, however, looks like it was an accident as neither human was aware of what the other was doing. But thank goodness for the quick-thinking action of the Australian Shepherd! She definitely earned her hero status.